Recently I was contacted by Liz at Price Chopper and was asked if I would like to be part of a group of bloggers that they would share some of their products with and also give us the opportunity to give those same products away to one of my readers. I quickly wrote Liz back and told her I would love to be part of their group! So, this last weekend after my trip to the gym, I went over to my Price Chopper store in Glenmont to pick up the goodies that were waiting there for me. I knew ahead of time what I was going to be receiving from the store and my mind had already been working on what I wanted to do with them. While we were not required in any way whatsoever to make and blog a recipe, there was no way I wasn’t going to challenge myself to do so. Being that this is the “Pancake House” it would have been too easy to have just made pancakes. You see, one of the products that I received was a Buttermilk Pancake Mix (Central Market Brand– which is Price Chopper’s brand). I also received some of Price Chopper’s brand pure maple syrup (dark amber) as well as the Central Market Brand Blood Orange Tea. My mind was working and the very next morning I made some baked donuts! I wanted to flavor the doughnut with the tea and of course, the glaze had to be maple. 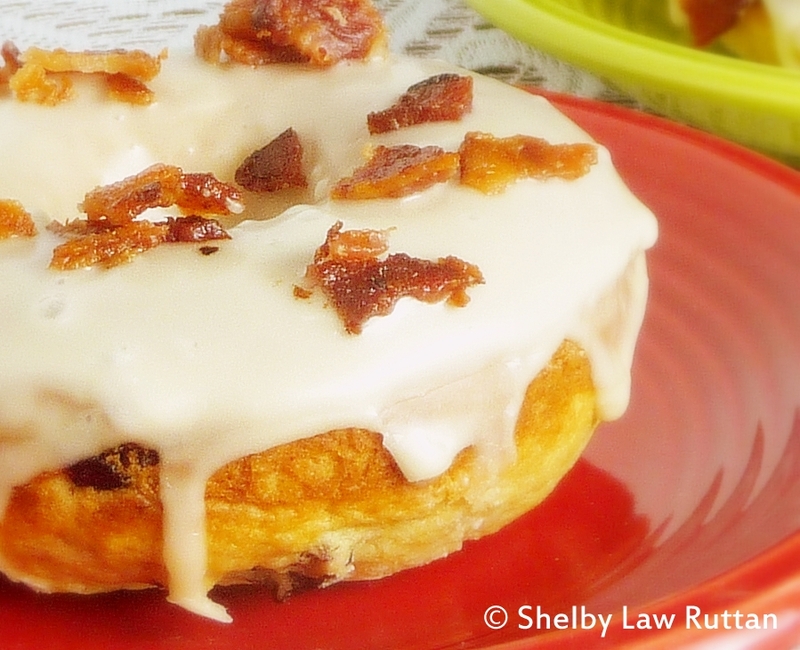 If the glaze had to be maple, then I also had to top them with bacon. So we had our pancakes and bacon in a much different way…and it was also delicious and not super fattening. While Grumpy really couldn’t eat much, he did try a mini one and declared them yummy. Now for the giveaway, which is really very simple. What do you need to do? Just leave a comment. You could tell me what you might do with the products should you win, maybe it would be to create some scones or a cake, or maybe you would just make pancakes 🙂 Maybe you will even make these doughnuts and share them with your family on Mother’s Day! So, whip up some doughnuts and serve them with some of the tea. You won’t be sorry and everyone will be happy! The giveaway will end on May 1, 2012 (my brother’s birthday!) and winner will be announced on May 2nd. In return for promoting the giveaway of Price Chopper’s Central Market Brand products, I received the following (which is also what the giveaway winner will receive): 1 box of Pancake Mix, 1 box of Blood Orange Tea, 1 bottle of Pure Maple Syrup. I am not being compensated in any other way by writing this post. quick and easy recipe for baked doughnuts using pancake mix! Pre-heat oven to 350 degrees. Prep baking pans by spraying with non-stick cooking spray. Mix pancake mix, sugar or splenda, cranberries, and cooled tea just until combined. Place pancake mixture into a large ziploc baggie, cut the corner to create a piping bag and squeeze batter into doughnut pans.Bake 15-20 minutes, or until toothpick comes out clean when inserted into doughnut. 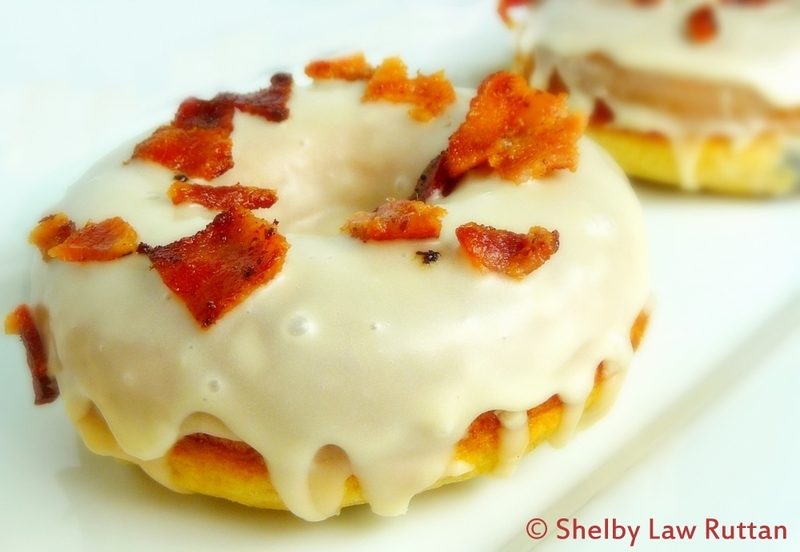 Cool slightly, then glaze with maple glaze and top with bacon pieces.To make glaze: combine powdered sugar and maple syrup. Mixture should be combined but thick. Add fat free half and half as needed to thing to glazing consistency. Top with bacon pieces immediately after glazing. Let doughnuts sit for a few minutes to allow glaze to harden.NOTES: These could also be made as mini muffin doughnuts, then rolled in powdered or cinnamon sugar immediately after removing from oven. 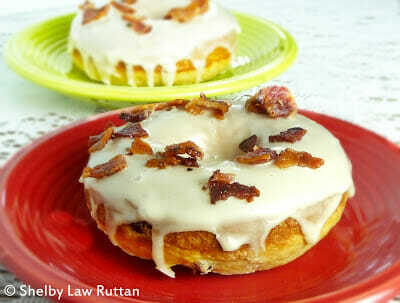 Try adding different flavors to the doughnut mixture as well as different flavor glazes. This is a very quick and easy way to make a baked doughnut! This would be a fun and easy recipe to make with your kids! I've bought their pancake mixes before and they are good. Shelby these look absolutely delicious! I can't wait until you have your own baking show on TV!! Thanks Teresa! Maybe Price Chopper could sponsor a "Baking with Grumpy's Honeybunch" segment LOL. I'd do it! Good luck! Looks delish. If I win, I will be making a baked pancake with maple syrup and maple sausage inside it. Sounds yummy Toni! Good luck! Emily, I will probably do the same this weekend. 🙂 good luck! This is a very creative recipe Shelby!! Oh my gosh, what great flavors in these, Shelby! Genius! Okay girl, these are just downright decadent! Very creative! 🙂 Thank you Valerie! Very easy too! Creative and delicious! I love bacon with something sweet. Girl, you hit the jackpot with these flavors. yummy!! I'm glad you liked the recipe! Thank you for letting me know! So many great flavors in these doughnuts!